LA's Sextile are in the UK promoting their new single Current Affair and last year's album Albeit Living. 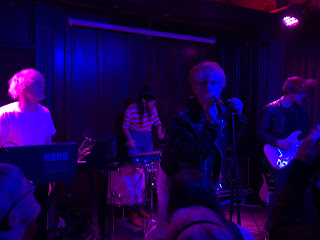 A packed out Castle Hotel in Manchester, with sweat dripping down the walls and from the ceiling, witnessed thirteen songs of blistering adrenaline from the four-piece that dragged their influences kicking and screaming into the here and now and left the audience breathless and demanding more. Support came from Hey Bulldog and Eyesore And The Jinx. 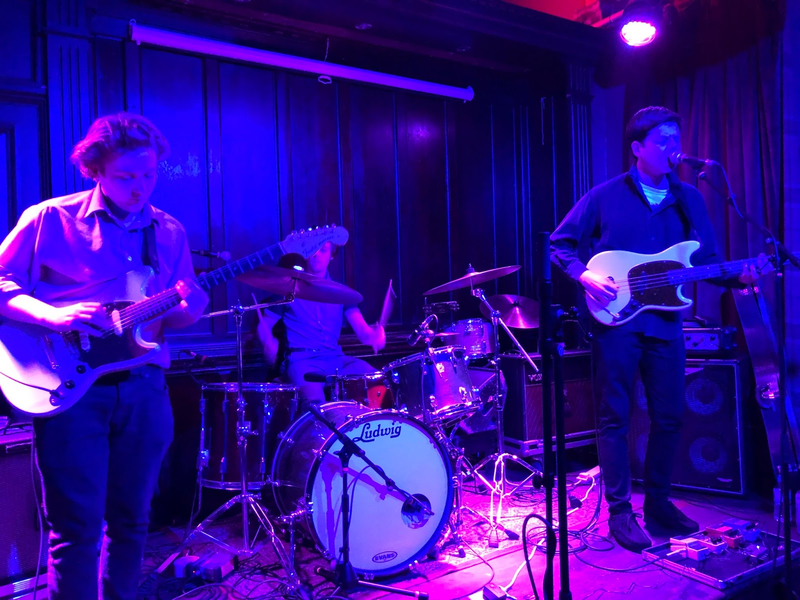 Openers Eyesore And The Jinx hail from Liverpool and they adopt an angular approach to their art, songs head in one direction, stop in their tracks and divert off somewhere in the opposite without ever feeling like they're disjointed or ill-conceived. 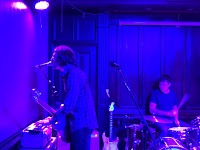 The likes of On An Island, Waste and Sleepless turn on a note or a drumbeat into almost a different song, but one that feels connected with what's gone before. Josh delivers vocals like bullets from a gun, hitting the intended target every time with short sharp bursts before his bass or his band mates decide enough is enough and they move to a different section of the song they're playing. They're a band with a lot of ideas that they're attempting to shoe horn into their songs and so far they seem to be succeeding and leaving the audience uncertain as to where they're going next rather than being predictable. Hey Bulldog clearly put a lot of stead in their musicianship and rightly so. They're a band that know the value of a guitar solo, of allowing a song to go into a breakdown where words aren't necessary and the music alone can lift you. Their songs take you on a journey, one that's more traditional rock and roll than it ever is the psyche scene they seem to have been labelled into. 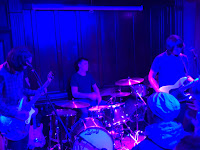 Previous single Divide And Conquer and Under My Spell dispel any such notion as they lose themselves in a wall of guitars, drums and bass, whilst forthcoming single Al Lupo shows just how they're developing their sound without fundamentally altering their ethos or changing their style for the sake of it. They've got a good loyal dedicated following out to see them tonight and it's very clear why. There's technical issues before Sextile come on stage just after ten, but with a thirteen song set taking under forty minutes this doesn't pose a problem for the timekeepers. Brady dedicates the set to Mark E Smith and it's the first some have heard of the announcement of his death. 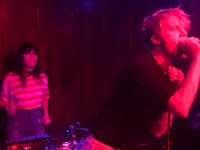 Their set shows that this wasn't some platitude that people roll out, you can hear how The Fall has shaped their sound, either directly or through the bands that have influenced them that were in turn influenced by Mark's gang. There's a spiky, confrontational, uncompromising ferocity to Sextile, from Melissa's stand-up drumming on both traditional and electronic kit, a cacophony of samples, keyboards and guitar and bass over which Brady has to force himself to be heard. It's not subtle by any means, but it gets the crowd moving, shuts them up and for the first time in ages has the Castle's floor bouncing as well as the temperature up at uncomfortable levels. Most of Albeit Living is featured in the set with a couple of exceptions and their approach matches the adrenaline and aggression of that record. Brady is both the agitator and the showman, one minute lost in a world of his own, the next strutting and posing for the cameramen inches from his face who seconds earlier he was oblivious to. 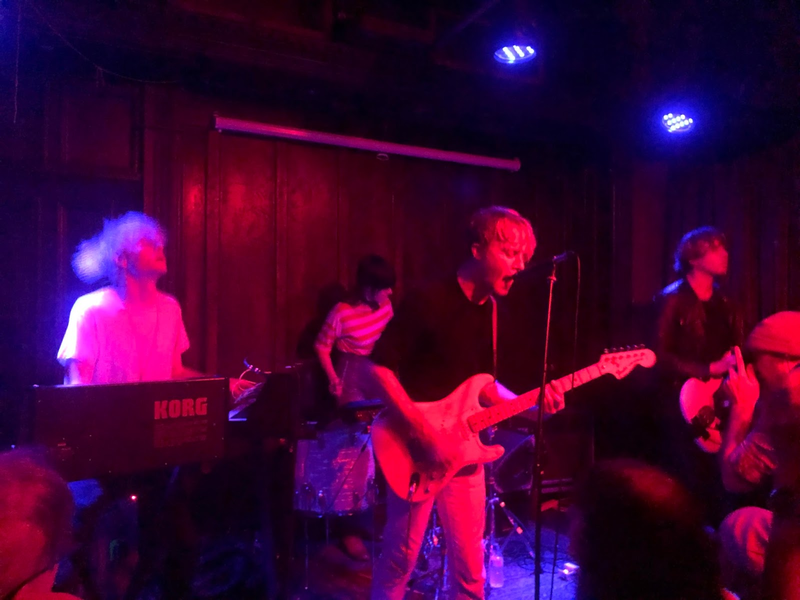 The energy never stops, never dissipates throughout as they charge through the likes of Ripped, Sterilised and Crisis, the titles as simple yet as powerfully effective as the songs themselves. French Song, which opens the set, Lazy Monday and new single Current Affair, none of which appear on that album, continue in the same vein, and whilst their influences may be worn very clearly on their sleeve, their boundless energy and style means that they've got a personality and a power all of their own. The crowd's response, often muted here mid-week, tells its own story, growing more excited and enthralled as the set progresses and Sextile build a bond with us. In a world where music is becoming more homogenised, there's a need for bands like Sextile to just come along, plug in and either lift people and take them with them or just blow them away. They make listening to music fun without ever compromising their integrity in the process. 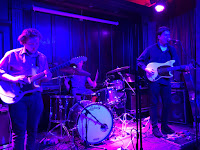 When people talk about a resurgence in guitar music and back it up with bands rehashing what's gone before but without the energy, they need to watch bands like Sextile imposing their own personality in a way that unsettles the audience, has an edge to it and has a genuine thrill and excitement to it. We may not see them in this intimate a space again. Sextile are on Facebook and Twitter. Their tour continues at Birmingham Sunflower Lounge (25), London Shacklewell Arms (26), Brighton Prince Albert (27) and Margate Tom Thumb Theatre (28) before heading to the Continent for a series of dates in the first half of February. Eyesore And The Jinx are on Facebook and Twitter.